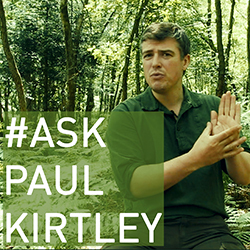 Ask Paul Kirtley is my video and podcast series that aims to answer your questions about wilderness bushcraft, survival skills and outdoor life. I’ve always been asked a lot of questions by email as well as Twitter and other social platforms. The aim of #AskPaulKirtley is to answer questions publicly so that as many people as possible can benefit from the answers. #AskPaulKirtley is produced as a video show as well as an audio podcast. If you’d like to subscribe to #AskPaulKirtley for your .mp3 player or phone, you can do so in one of the ways below. If there is a platform on which you’d like to see these podcasts to make it easier for you to listen, then drop me a message to let me know (you can contact me here). Make a public post on Instagram, including a photo or video (which will feature on the show) and include the hashtag #askpaulkirtley, so I can find the post. Email a question with #askpaulkirtley or “Ask Paul Kirtley” in the message subject. I want this to be helpful to you and others, as well as fun and personal. So, we need to keep things sensible. The idea here is partly to take the strain off my email inbox and get answers out to people in a more timely fashion. Many people write emails with questions about bushcraft, survival and outdoor life in general. Rather than send an answer to just that one person, I’d like others to benefit from the answers too. So, just in the same way I’d previously write an email answer, here I’m going to speak the answer (which is waaaay quicker than my typing, so I’ll get more questions answered as well as benefiting more people). Please use common sense about what can be answered verbally. Even though I will be releasing a video version of the Q&A, I won’t be able to demonstrate skills for example, as I will be publishing the answers as a podcast as well as a video. Remember this is designed to take the place of me answering in the written form and allow me to answer more of your questions in a more timely fashion. If you are leaving a voice message, please keep your question under one minute in length. If it goes a little over, that’s fine, but please keep it concise and to the point. Spammy, disrespectful, rude, or unreasonably personal/private questions will not be considered. I use SpeakPipe.com, a clever web service that allows anyone to leave me a voicemail message through the Internet. I receive a notification when you leave me a voice message. All you need in order to leave me a message is an Internet connection and a microphone. It works via mobile devices as well as laptops and desktops. Please note that by submitting a voicemail question, you’re allowing me to share it publicly on the podcast and video. And remember if you don’t want to leave a voice message, you can tweet me @pkirt or email me with hashtag #askpaulkirtley.